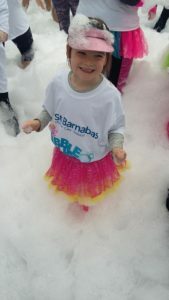 Amber Searle, aged five from Grantham, took part in Grantham’s first ever Bubble Rush with her mum and raised an amazing £340 for St Barnabas Hospice. Grantham Bubble Rush was held on 30th September at Stoke Rochford Hall, and saw over 500 people attending to walk or run five kilometres through coloured bubbles and fantastic scenery. Over £30,000 was raised for St. Barnabas Hospice, making the day a huge success. Amber is already excited about next year’s Bubble Rush, which St Barnabas will host at Stoke Rochford Hall on Sunday 8th July 2018. “I want to do the Bubble Rush next year with my Daddy and my little brother. I loved the bubbles which went even higher than my head, and they made me and Mummy all colourful!” she says. Amber’s amazing fundraising efforts came about by asking her school friends and her family for sponsorship. Her mum also helped by sharing the JustGiving link on Facebook for people to donate.